Sun is high. Rain is coming. God whistles. We come running. All Aboard the Ark pairs simple rhyming text with charming watercolor illustrations in this delightful board book. Perfect for bedtime or any time, this sweet story is told from the point of view of the animals who board the ark. 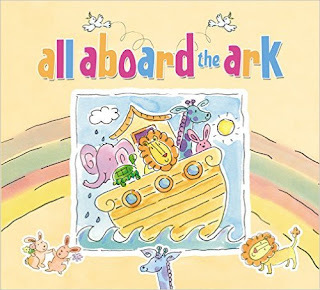 All Aboard the Ark by Zondervan is an incredibly cute book! I absolutely love the beautiful water color illustrations throughout the book as well as the simple rhyming. My daughter adore this book and have been asking to read it at bedtime because they love seeing all the animals and hearing the animals point of view. I think hearing this story from the animals point of view is incredibly unique but also a wonderful way to tell this story. This would make a terrific gift for little ones this Easter! You can find All Aboard the Ark by Zondervan on Amazon, Barnes and Noble and other bookstores.